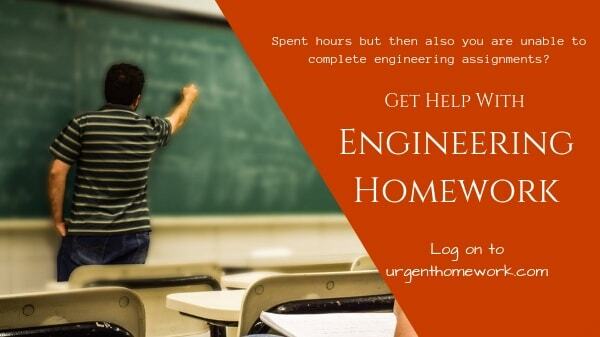 Urgenthomework welcomes you to the engineering section where you will get solution of all your questions in which you have spent many hours but then also you are unable to complete it. We understand Engineering assignments are never easy to solve alone. Assignments and projects given to engineering students involve creative skills, technical skills and new ideas. If you have been looking for help in your engineering assignments, projects, homework and many more than you can contact our expert team. We also provide tutorial classes for various subjects of engineering such as Data Structures, Engineering Physics, Engineering Chemistry, Computer Architecture and Architecture, Hardware, Manufacturing, Automata, Electrical engineering, Basics of engineering, Engineering Drawing etc. We provide help with engineering homework, engineering assignment, and engineering coursework. At the desk of urgenthomework you get opportunity to meet the experts who will help you from very beginning of your homework till the end. We have been serving students around the globe since decades and have provided excellent help on various streams of engineering. We have appointed different teams of tutor on various subjects. The professionals hired by us have been selected only after passing a tough series of test. Our professionals have years of experience in teaching and have completed their education from best universities of the world. We ensure that only best people are working with us. We have many striking features that attract large number of people. We provide 100% original study material, step by step solution, proper presentation, assignments are rechecked and then only given to customers. Our professional team is available every time and everywhere and submit results before deadlines. Our prices are easily affordable. If you are not satisfied by with our services you can request back for your money. Contact today and get solution for all your problems! !